SQLSaturday Chicago was another fantastic experience! It was my second one and was just amazing. It definitely helped me to recharge my SQL mojo and remember that I really love doing this stuff. Was a rough month at work and really needed that recharge. We drove down on Friday and got there in time for the speaker dinner. Enjoyed a couple 312’s and pizza. It was nice to see folks I hadn’t seen since the last event and also to finally put some faces to names. Conversation went to one of my favorite topics too…how people ended up as DBAs and in the industry. Seems so often it’s an odd twist of events that land people in the DBA role. I was then kidnapped by some fellow co-workers for a little birthday celebration. Thank you Kandy, Teri, and Caroline! My presentation went surprisingly well. I had so many doubts coming into this one. I had been swamped at work so didn’t prepare as much as I normally like to do. Then I checked out the lineup at the same time. When I saw Brent Ozar’s session going on at the same time my heart sank. One because I would have liked to catch his session too but more because I thought I would be presenting to the walls. I was so happy to see the room filled up! I think the session went well. I had folks who seemed really engaged and asking great questions. I felt more at ease too. Getting a bit more used to this public speaking thing I guess. I know some of my first sessions you could have pushed me over with a feather and fried an egg on my face. Oh and when it’s over the way that heaviness lifts and you can relax…also good stuff. Luckily I didn’t have the same jerkface that was in Christina Leo’s session in mine either. I always have “that guy” in mind when I’m preparing for these. I know all the presenters were ready to grab torches and pitchforks and hunt him down…I mean really…really? Read about her experience here. Then came my favorite part..the aftermath! 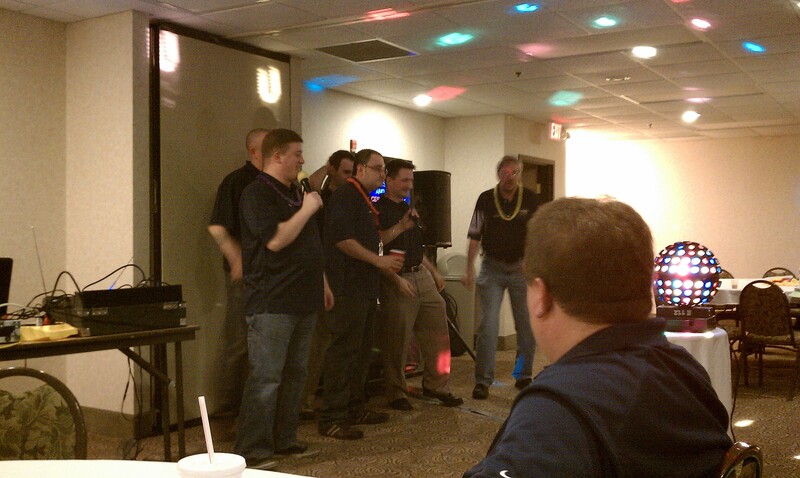 This was my first experience with SQL karaoke and it was outstanding. I am so not a karaoke kind of gal so didn’t actually get up there and sing but it was fun to watch for sure. I would have to say my favorites were “Summer Nights” with Jes Borland and Jason Strate and “Pokerface” with Nicholas Cain and Jose Chinchilla. Then when they kicked us out of that room we moved to the lobby for more chit chat and jello shots. Oh the stories! I just ate up every minute of the talk with everyone! I stayed up till 4:00am taking it all in..and that’s unheard of for this poor mom. I can’t remember the last time I stayed up that late. Grant Fritchey started talking about how he got where he is…what was I going to do leave? Ummm no. Thank you all so much for the encouragement, advice, and just in general good vibes. Them SQL people are good people I tell ya! 🙂 And thank you too to all the people who put on a really fantastic SQL Saturday…great job!